Sick of people going 30-1 or 60-4 and just zipping by and getting one shot kills with zero opposition. You have a handful of AA guns that are easily destroyed with absolutely no cover. It's like a red flag for anyone to knife, snipe, nade you by hopping on that turret. This is a fundamentally broken aspect of the game. ...but flying takes heaps of skill!!!! - best joke of 2017. The 24/7 planehoggers in the trenchfighters must have a syndrom or something. Nothing is more shallow and boring and easy than that. How can they endure the boredom? Unless they dont get bored and value the big K/D ratios from it. For whatever reason. Perhaps it's to feed their E-ego. Characterized by whining about how they cant counter the AA truck. I kid you not. Don't forget, it wouldn't be a problem if the entire team would just ignore the infantry and tanks in front of them and stop to shoot at them. Make the bomber buster plane faster and more agile by default. Now there isn't a counter all aircraft that also functions as a dive bomber (coincidentally the best bomber for the reload). Attack planes provide better air to ground support, but the pilots that fly fighters only do so because they're immune to anything but another fighter. The attack plane is also much slower and less agile than a fighter, making it much easier to down with AA despite having more health than one. The fighters are fully ruining this game for me at the moment, I was playing TSNP and was killed 9 times by the same level 105 and his lovely 55 Star trench fighter. The darts are too powerful, fast and the self-repair is too quick and replenishes too much health at once. I can't wait for all the plane bumboys to start flaming me on this but you can all continue to live in your 3.0+ KDR bubble and do one, if you think sitting in a near indestructible vehicle and farming kills takes any sort of skill you should try getting your boots dirty at some point. Your biggest problem on the AA Isn't the enemy infantry or tanks IMO. It's still Fighters that are going to kill you the most on the AA. Playing some of it last night and one game the previous night, it's even worse now that AA Doesn't shake the aircraft. It definitely annoyed me that it did, but it's so easy now to just fly through the AA Fire and drop darts on any AA Gunner. It made it much easier to farm infantry because I wouldn't have to spend the time to dart-snipe the gunner, I could just fly over and be done so much quicker. No skill needed, every rookies can keep even the most skilled pilots out of the map. I love flying in BF1 but once you know where the static AA's are it's easy to avoid them and learn what angle to take them out from (due to sight lines), AA trucks on the other hand are a different beast due to being mobile and giving the player overhead cover. Conquest and operations are a no go with the planes. They are the most useless people in a team. They are kdr hunters from cod thats all. The trench fighter is not balanced. There are two aircraft dedicated to ground attack, together they account for 9.8% (3.8% bomber, 6% attack plane) of vehicle kills. The fighter accounts for 13.6% of vehicle kills. These stats are as of 3/19/17. The air superiority platform is doing more ground killing by a wide margin than BOTH of the aircraft dedicated to ground attack. The upward trend of fighter kills has not stopped at any point since the games release and continues to do so. Both of the ground attack aircraft have been steadily decreasing. Common sense would indicate a lack of balance when the aircraft designed to kill other aircraft primarily is so clearly better at killing ground targets than the vehicles designed specifically for that purpose. Edit: I specifically address the trench fighter because AA fire is even less of a concern for it due to maneuverability and speed. It also has no other threat in the air besides other fighters that may, or may not, decide to engage. The trench fighter is the problem. Fighters should not be uber effective ground attack planes. Fighters are for shooting down bombers and attack planes. Just replace the Trench Fighter with something else. If you want to get in a Fighter than your job should be to fight other aircraft or behemoths, not farm infantry. Just backing this up. Fighters already were able to easily just outrun the AA Most of the time, and had this been before the patch, I would've just kept flying and dart-sniped the gunner. However, now (as shown in the video below), I can just fly at the AA And easily just bomb him and fly off while only losing effectively half my health (I went at him with 96, and came out with 45). Unless an enemy plane jumped on me afterwards, I was able to just casually fly out and repair afterwards and if someone went back on the AA, just do it again. 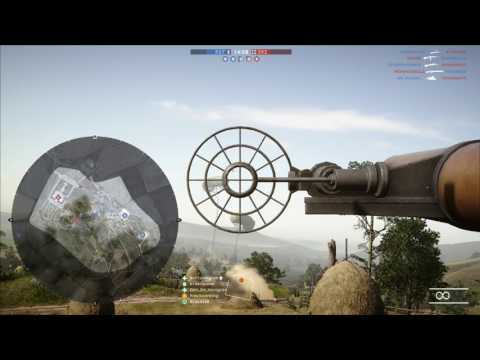 If that aa gunner wasn't shooting the attack plane first, I think you would have met your maker. Perhaps. Then again, I too could have handled that differently instead of just flying straight at him. Sick of people going 30-1 or 60-4 and just zipping by and getting one shot kills with zero opposition. ME TOO! SHOOT AT PLANES!!!!!!! Another one of the best jokes of 2017.